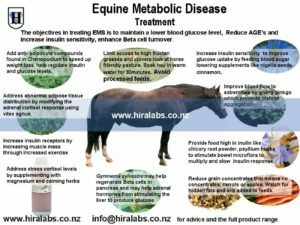 Equine Metabolic Syndrome is an endocrine condition that starts with raised blood glucose levels and progresses into insulin resistance, obesity, diabetes and laminitis. Glucose (sugar) is required to fuel most metabolic processes in the body. Insulin is then produced to regulate blood sugar concentrations in response to elevated blood glucose and its utilization to include glucose uptake by cells and the formation of glycogen or fat. Insulin resistance is defined as a reduced sensitivity of the body’s cells to insulin’s role in glucose uptake.In the case of insulin resistance, the cells become resistant to the glucose-uptake action of insulin, meaning that more insulin is needed (hyperinsulinemia) to keep blood glucose concentrations within normal limits especially after high energy feeds are given. As the condition progresses higher than normal insulin concentrations are ineffective and blood glucose levels remain abnormally high. This then limits energy availability to the cells with above normal insulin levels lead to a range of degenerative inflammatory condition. Laminitis is also an endocrine condition leading to changes to animal’s blood pressure causing it to rise, which causes to an increase of blood supply to the feet. Paradoxically constriction of blood vessels supplying laminae occurs reduces blood circulation which then will deprive the area of oxygen and nutrients causing inflammation. Fluid then leaks from vessels and the increase in pressure inside the hoof causes pain. Yes it is. Follow the link to our page on Cushings explaining how the adrenal, cortisol axis influences the endocrine system along with insulin and blood sugar modulation. BCS Body Condition Score using the Henneke scale assessing the level of body condition from 1 to 7 with 1 being very underweight and 7 grossly overweight or obese. Adiponectinis a beneficial fat-derived hormone that normally improves insulin sensitivity. Obese and laminitis-prone horses/ponies often have low adiponectin levels and this has been shown to be a good predictor of future laminitis risk. Digital Pulse The digital pulse provides information with regards to the health of your horse’s hooves. This is especially important for owners of Insulin Resistant (IR) or Cushing’s horses. Horses affected by IR or Cushing’s often suffer from laminitis. When taking pulses, you are feeling the blood flowing through the artery into the hooves. In a healthy horse the digital pulse is quite hard to find because the normal flow of blood is unrestricted. ie no swelling or constriction of blood vessels increasing pressures. Cecum is a large sac located between the small and large intestines. The cecum has a capacity of around 8 litres which houses the micro-biome ie billions of micro-organisms for the digestion by (fermentation) of cellulose and other fibrous plant tissues. 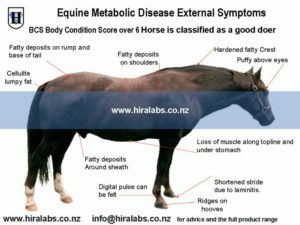 These microbes make energy constantly available to the horse in the form of VFA (volatile fatty acids) as well as synthesizing B vitamins and protein . These microbes are dependent on the proper acidity or pH of this part of the intestinal tract. Large fluctuations in the pH can cause changes in the population of microbes. AGEs Advanced Glycation End Products are proteins or lipids that become glycated as a result of exposure to sugars. They can be a factor in aging, systemic inflammation and in the development or worsening of many degenerative diseases. VFA Volatile Fatty Acids Volatile fatty acids are a group of fatty acids produced by the cellulose digesting microbes in a horse’s hind gut.The most common VFAs are acetate, propionate and butyrate. They are a by-product of the fermentation process to degrade cellulose found in forages. Which is absorbed them through the cecal and colonic walls, to be distributed throughout the body as energy for a range of biological processes. Acidosis This generally refers to the lowering of pH (an increase in acidity) in the cecum and/or colon. Hindgut acidosis is a health risk, as the lower pH can kill beneficial bacteria and allow dangerous pathogens to prosper – the beginning of more serious digestive distress. Horses had increased insulin resistance when fed high sugar/starch feeds especially while they were not obese. THis indicates metabolic changes before external signs are evident. Some studies point to metabolic disruption when horses were feed energy dense rations in winter when a high fibre diet was required for the metabolic processes of maintaining body heat. Obesity – Overweight horses tend to be insulin resistant, as are “easy keepers” even if they are not obese. Adipose tissue has hormones that increase ‘fat production’ along with increase AGEs (Advanced Glycation End Products) and systemic inflammation. A higher than optimal cortisol set point which leads to a range of physiological changes including disruption to magnesium and calcium utilisation. Unlimited access to lush grass high in fructans or clover. 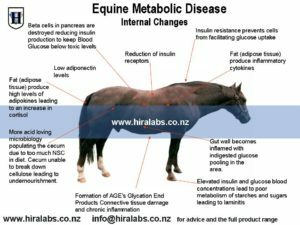 Age – Old horses (>20 years) seem to be more prone to insulin resistance, probably secondary to pituitary dysfunction (Cushing’s disease) again as an organism ages its cortisol set point levels get progressively higher. This is why enforce immobility and starving is particularly counterproductive. Horses with a family history of laminitis may be insulin resistant. Feeding processed feeds containing hidden transfats. Periods of enforced immobility and not grazing will lead to adrenal disruption and an increase of cortisol levels. Remember that grazing (ie head well below the wither) is required for extended periods of time disengage the adrenal response. Periods of unrelenting stress. This can occur with horses that struggle with their position in herd hierarchy or if they have moved to a new home experiencing a totally new routine and /or environmental conditions. Horses with a limited gut flora spectrum in particular Akkermansia muciniphila a beneficial bacteria responsible for healthy insulin levels and conversion of sugars. 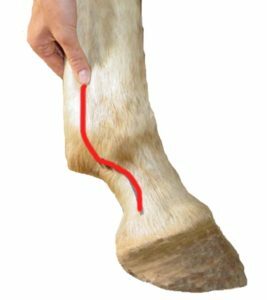 There are a number of tell- tale signs that point to EMS Sometimes the onset of laminitis is an indicator that the endrocrine system is being put under strain. 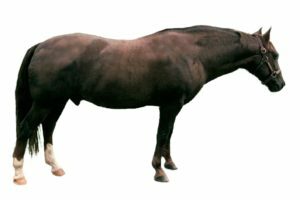 Some horses and ponies can have a fairly lean overall appearance and still have the cresty necks and fat pads above the tail. Loss of weight and muscle which changes the effectiveness of ketone burning processes. Lack of stamina also caused by poor blood flow to extremities. The objective of any treatment will be to increase insulin sensitivity, lower blood sugar levels and adjust the process of glycation which is responsible for degenerative problems ie oxidative stress and the destruction of DNA.Changes begin to occur internally which will hasten the onset of insulin resistance and metabolic disruption. Increase in white adipose tissue which is no longer considered as just fat designed to store energy but it is more of a hormone responsible for regulating physiologic processes, including immunity and inflammation. Fat begats fat unfortunately. Changes to immune regulation due to disruption to communication between lymphocytes and adipocytes. Adipose tissue produces and releases proinflammatory and anti-inflammatory factors, including the adipokines leptin, adiponectin, resistin, and visfatin, as well as cytokines and chemokines. Poor levels of gut flora in the cecum in particular Akkermansia muciniphila. Beta cells in the pancreas are either destroyed or altered. 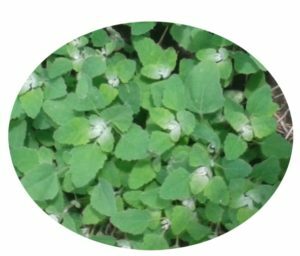 GLP-1 mechanism is working on overdrive anticipating the arrival of high quantities of starch/glucose, and high sugar grasses. Reduction of insulin receptors which leads to higher than normal levels of blood glucose. Circulatory changes cause inflammation and congestion of the sensitive laminae of the feet. Blood flow to the retina is affected. The Formation of advanced glycation end products (AGEs), which cause protein fibers to become stiff and malformed. Much of what is known about glycation’s ill effects comes from diabetes research: The connective-tissue damage and chronic inflammation resulting from diabetics’ sustained high blood sugar. Now in the case of each of these changes nature has provided plants and minerals that will restore the endocrine system to its optimum functioning levels. I have started a landscape page called EMS landscaping which will be added to as we filter and distill our current research. In other words a-work-in-progress. Some of the starting point information will be in the list found in Prevention and Treatment. Reduce or eliminate all processed and prepackaged feeds for at least 6 months to see if there are any noticeable changes. Change your pastures to include species that are known to lower blood glucose levels ie chenopodium (fat hen), hedges and some trees can help with this like Japanese Raisin Tree, and silver birch. Provide feed high in inulin as these will improve gut flora. Chicory root is one such plant. Provide fodder that requires lengthy chewing to stimulate saliva which will further buffer pH levels through the digestive tract. Soaking hay for 30 minutes in warm water and 60 minutes in cold if it is known to contain high amounts of sugars > 10 to 12%soluble sugars. Lower GI by adding coconut oil to feed mix. No more than 16% of the diet. Ensure your horse is kept off grasses high in fructans. Ensure that your horses are not grazed on dairy pasture or specialty grasses hybridized and genetically modified to resist mycospore and fungal infestation. Introduce beneficial microbiology as a foliar spray. Achieve weight loss through exercise(minimum of 30 min daily) instead of enforced dieting. Eliminate or limit grain and high sugar feeds including all processed and premixed feeds. Be wary of hidden polyunsaturated oils. These are pro-inflammatory oxidised oils now implicated as being carcinogenic. Feed omega oils that have both gamma linolenic and alpha linolenic acid will encourage production of the anti-inflammatory prostaglandins, E1 and E3. These must be stored in glass and extracted cold without the presence of heat, light or oxygen. Seeds with the seed coat still intact are safest ie linseed can be crushed just before feeding. If concentrates are needed to maintain body condition, feed products formulated to have a low glycemic index. For example, oats are used as the standard with an index of 100. Plain beet pulp has the lowest index in most studies and barley has the lowest index of the commonly fed grains. Restrict grazing time but only if the horse has a pre-existing case of laminitis and grass is lush. Remember that enforced inactivity can lead to anxiety and raised cortisol levels. Vitex agnes can be used if the adrenals have been overactive along with ashwagandha which will act as a adaptogen and help bring the body into balance. Herbal supplements that enhance the immune system and address bacterial toxins in blood. Echinacea extract 3-5ml daily one week on and one week off. Herbal chaffs and acidophilus supplements to restore normal gut activity and liver function. We have some landscape design tips shortly available on planting for EMS landscaping . Just be aware that some plants touted to be the latest miracle cure will be so for only a season and that nature has a storehouse of such plants for each latitude, altitude and microclimate… So those very expensive botanical delights that can only be found in darkest Peru actually exist on our very doorstep oftn as weeds. Cheopodium is just one. Add a few leaves to your daily smoothie and you will find that tummy fat will literally melt.